This is another lazy recipe. Sorry, I've been extremely busy this weekend. You see there is this place, it's called Hyrule. Hyrule's past is being threatened by a great evil and it's up to me to destroy it. You can see my dilemma. There are lives at stake here. Yes I'm talking about a video game, this one specifically. Needless to say I spent a significant portion of the last two days playing (*cough* fifteen hours.... *cough* so far *cough*). And it was in the middle of my quest when I set the controller down for a second and decided that I needed to make something to post. I also had a serious chocolate craving. So this is what I came up with. Not pretty, but tasty. These cereal drops are an adaptation of the Honey-Peanut Butter Cereal Drops I did for Easter this year. I replaced the peanut butter with chocolate and went back to the corn syrup from the original recipe. I really didn't want honey flavoured chocolate. And because I typically like my brownies on the semi-sweet to bittersweet side, I went with a semi-sweet/unsweetened chocolate combination, but any of these ingredients can be altered with success. Milk chocolate, dark corn syrup/honey, brown sugar. Heck, use Bran Flakes for a fibre boost and you can call it health food :). And once you decide to do this recipe, you'll be done in ten minutes. I actually spent more time thinking about it than I did making it. The flavour is definitely that of a dark chocolate brownie or truffle, but the added texture of the crispy corn flakes makes them much lighter and way more addictive. They're also quite chewy like a Rice Krispies treat; which, in all honesty, I suppose they kind of are.. except without any of the ingredients that actually make up Rice Krispies treats :). So what are you waiting for? Go make these. 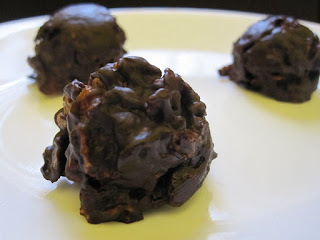 They're quick, quite tasty and really quench that chocolate craving. A fraction of the time of a brownie, with all the brownie flavour. And I promise, next week I will have something better than a four ingredient peanut butter cookie or a no-bake chocolate bon bon. Unless of course I haven't found a save point, then you're on your own :). Have ready a large cookie sheet lined with parchment paper. In a small saucepan set over medium heat, add corn syrup and sugar and stir to combine. Continue to stir until mixture comes to a full boil. Remove from heat and stir in both chocolates until completely melted and combined. Pour cornflakes into chocolate mixture and gently fold everything together, being careful not to crush the corn flakes and making sure to coat them completely. Scoop by rounded teaspoonfuls (or cookie scoop) onto prepared cookie sheet and place in fridge for ten minutes to set and cool. I wonder what would happen if they created a video game that would allow you to bake and save the world at the same time! You might cook yourself out of house and home! I did a no-bake column for Serious Eats more than a year ago, and it can be tough to come up with reasonably 'healthy' no-bake recipes--these look really good and pretty low on the guilt spectrum as cookies go. A rice-based flake cereal like Special K would also 'work,' I bet. The Baker's Nuts Adventures: Quest for the World Peace Cookie :). (Wow... I'm a huge nerd). Special K definitely, though you might use a little less, since Corn Flakes have more volume. And yeah these are a little lower on the guilt scale, that is until you eat a dozen of them :). So how did you do with the game? The cookies look wonderful. I hope you have a good day. Blessings...Mary. uuuummm I don't know what you're talking about ... :)... 1/2? It clearly says 1/4 cup :)... hahahahhaa.. Thanks for pointing out the mistake (two of them) Gloria :). Hey, no problem! If I make these, I gotta know!!! I'll be vacationing in sunny Fort Myers soon! (Leaving hubby up here to fend for himself) Something easy and quick to make while down there is perfect! BTW, I enjoy your sense of humor-it comes out well in your blog! Good writing! Thanks Gloria, that means a lot :). My sense of humour is rather quirky, and it's good to know that people get it, and don't just think I'm a jerk :). I love easy fast recipes. These look good. I know what you mean when you need a chocolate fix nothing else will do until you have some chocolate. @Words -- Unfortunately that's like every other day for me :). @Kavi -- Welcome :)! I think you're the first person to ever call themselves a fan. Glad you're enjoying my craziness :). Zelda + cookies = awesome. Had to comment. Zelda 64 Ocarina of Time brings back so many good memories.